Caroline and I have been friends since I was 8 years old or so (and she was 11). 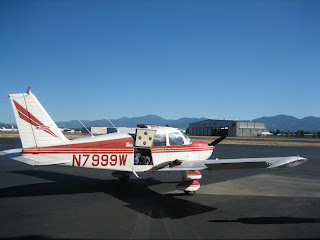 When she was 18 she got her pilot's license and was able to fly the Cessna her Dad used for his business. Despite the fact that it's been 20 years I had never been up in the air with her. Hard to explain why. I guess when she first got it my Mom might have been nervous about letting me go up with her and then I've been living out of state pretty much the whole time since high school. Meanwhile her husband Luigi has gotten his license too and both of them have become instrument rated. 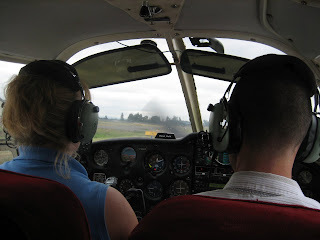 When we moved back to Oregon I decided it was high time to get up there and experience flying with them. Brian watches Caroline closely for tips on entrance technique. Fully qualified pilot on the left, dilettante on the right. "What's happens if I push this??" On the way home, Luigi had Brian take the yoke. 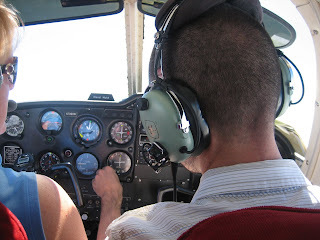 Instead of just having him "fly" while we were cruising, he handed control over as we were needing to descend to the airport. 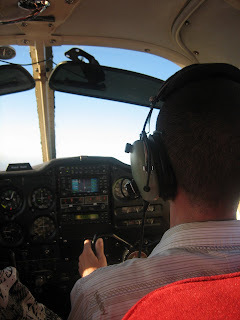 So Brian had to try and bring the plane down at a steady pace, while keeping us on the right trajectory for the landing vector, while adjusting the lift. Let's just say that this didn't fill his wife with tons of confidence. And is it a bad sign if the only time he felt motion sick was when he was doing the flying? 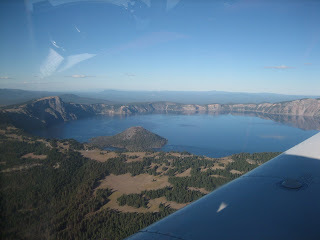 The weather was beautiful on our trip home so we took a detour to do some sightseeing over Crater Lake. Brian had somehow never seen this famous Oregon land mark (and national park!) so we did a flyby. It was purty. It sure beat spending 9+ hours in the car and it was a great way to see the state's landscape from a new perspective. We'll definitely be going up with them again.